What has enslaved you this past year? What has limited you? In Hebrew, Egypt is called Mitzrayim which can also be translated as “from narrow places.” What have been your narrow places and how did you overcome a limitation you had put upon yourself? For Kids: Like the “Little Engine that Could,” what’s one thing you didn’t think you could do, but found out, if you tried, you could do. When have you been the wicked child? Have you done something naughty or not followed the rules? Is it ok to be rebellious or do things differently sometimes? When? 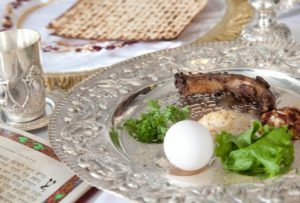 What is the coolest, most unique family tradition that you do for Passover? If you do not have one, can you come up with one as a family? How did YOU welcome a stranger or a new friend this year? There is a midrash, a Jewish legend that says when the Israelites came to the Sea of Reeds (the Red Sea) and Moses lifted his staff to part the sea, it didn’t immediately part. All the Israelites stood there waiting for something to happen, and everyone was afraid to take the first leap of faith. A brave man named Nachson slowly waded into the water. First the water came up to his knees…nothing happened. Then it went up to his waist. Still nothing. Then his chest and his shoulders…nothing. Finally, when he was chin deep-the water finally parted. Like Nachson, when did you take a risk and try something new? Was it scary at first? Was it worth taking the risk? What is the chametz, the heavy stuff that you want to get rid of that holds you down? Are there any bad habits you’d like to get rid of this Passover? What would you like to be free to do this year? For those of us living in the Diaspora, outside of Israel, how can we stay more connected to Israel? 2. Pour ¼ – ½ c. portions into a greased skillet. 4. Top with syrup and enjoy! 1. Combine oil and water in a saucepan. Bring to a boil. 2. Add dry ingredients. Mix well until mixture pulls away from side of pan. 3. Mix for 5 minutes then add eggs one at a time. Mix for another minute. and rolls are done, about 8-10 minutes. 1. Preheat oven to 350 degrees F. Brush oil onto a rimmed baking sheet. 2. Place the matza cake meal, salt and pepper into a gallon plastic bag. until all chicken is coated. 5. Bake for 12-15 minutes or until pieces are baked through. 3. Pour into a greased 9×13 baking pan. Top with the remaining cheese. cheese to brown, about 10 to 15 minutes. *This recipe doubles nicely and freezes well. 4. Experiment with your favorite topping. 1. Place farfel in a colander. Pour water on top. Drain after farfel swells. 4. Add farfel to egg mixture. Mix and pour into greased 9 x 13” pan. and bake for an additional 35 min-40 minutes. 1. Line a cookie sheet with foil and lay matza on pan. 3. Brush matza with brown sugar mixture. until it starts to bubble. Remove from oven. 6. Spread the chocolate to cover the matza. 7. Freeze until hard, then break into pieces. When: On a Sunday morning shortly before Pesach. Deliver bags of Passover necessities and treats to Russian immigrants and other needy families in our area. Contact Tina Levine or Monya Cohen for more information. ORDER YOUR MATZOHGRAMS TODAY! 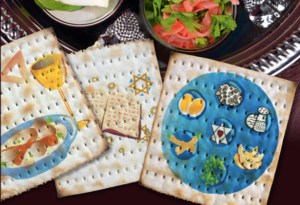 Add a colorful, snazzy box of matzot to your Seder table AND support Temple Beth Ami! These make great hostess gifts and are certified Kosher! Click HERE and be sure to enter our code before checking out: RFM491.